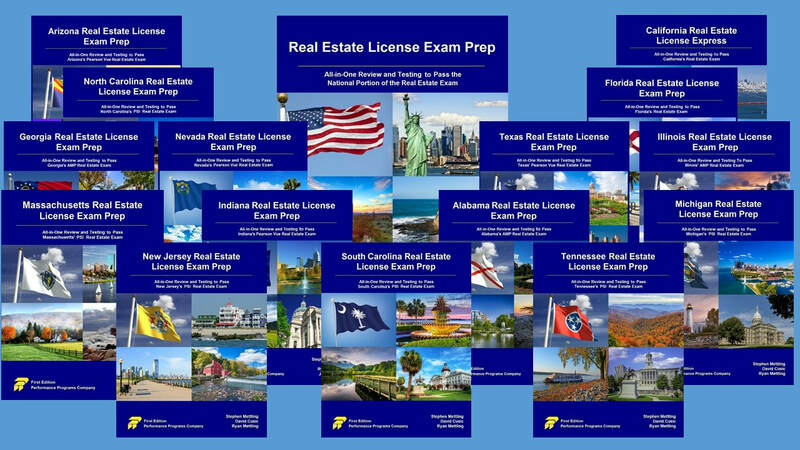 ﻿We know the real estate licensing exam can be tough, and very nerve-wracking to prepare for. That’s why we created the Real Estate License Exam Prep (RELEP) series the way we did. Since we have been managing real estate schools and developing curriculum for forty years, we know how all this works – or fails to work. RELEP is comprehensive in that it contains both key content review and testing practice. And the text review is state-specific – not just simplistic national content, but terse, relevant and accurate state laws and regulations presented as a well-organized set of state ‘key point reviews’ ideal for pre-test memorization. But let’s not dismiss the importance of the national content either. RELEP’s national key point reviews are a succinct compression of tested national principles and practices that comprise the national portion of state license exams from coast to coast. Our content is drawn from our own national textbook, Principles of Real Estate Practice – one of the most widely used principles textbooks in the country. Finally, our national content, as well as our question selection, is further tailored to each state testing outline promulgated by AMP, PSI, or Pearson Vue. Thus the breadth and depth of the law reviews and test questions reflect the topic emphasis of your state’s testing service and your state's license exam. A word about the test questions… RELEP’s testing practice section consists of ten national practice tests, three state practice tests, and one state exam sample test. The practice tests are roughly 50 questions in length and the sample test is 100 questions. The test questions are designed to cover the content covered by the law reviews – which reinforces your learning of the total body of information tested by your state exam. The questions are direct, to the point, and designed to test your understanding. When you have completed a given test, you can check your answers against the answer key in the appendix. You may also note that each question’s answer is accompanied by a brief explanation, or “rationale” to further reinforce your understanding. We have released RELEP for Alabama, Arizona, Arkansas, California, Florida, Georgia, Illinois, Indiana, Massachusetts, Michigan, Nevada, New Jersey, North Carolina, South Carolina, Tennessee and Texas. There is also a generic, national version of RELEP available.